As of this writing, I have finished my term as the 2016-17 President of the Arizona Association of Nurse Anesthetists. I am humbled to have served in leading our organization, and this is my final communication as President. I'd like to share a few thoughts and the story of how this year fits into the past 5 years. Mr. Ali J. Baghai, CRNA, President, 2015-16, (left) and Mr. Joseph A. Rodriguez, CRNA President, 2016-17 (right) relentlessly - and successfully - advocated for and defended Arizona CRNAs during their terms. My term was part of a 5-year plan, and in 2012, AZANA identified goals (lofty) and deficiencies (many), our volunteers and leaders (few) and our level of commitment (extraordinary). In all, we aimed to make Arizona the best state for CRNAs to live and practice. By 2016, AZANA moved from being a few volunteer CRNAs into a full-fledged professional state association - so much so that AZANA took the lead among a coalition of advocacy groups in a large scope of practice battle. We were proud of our effort, but ultimately unsuccessful. And, we still needed a number of organizational enhancements. So in 2016-17, we decided to take on a great deal - and we were fortunate to have in place a humble, diverse leadership team, focused on delivering real results for our membership. So let's review the year. LEGISLATION: Done! We won our legislative battle and have our first update in scope in nearly 100 years - and the impact of SB 1336 cannot be overstated (here's one story of the real results - there's already more) (SB 1336: Who benefits?). COMMUNICATION: Better than ever. AZCRNA.com is up and functional with some posts gaining significant attention both in and outside Arizona. Like, this one, after the ASA made a target of Arizona CRNAs. EDUCATION: Incredibly, AZANA's Sun and Fun is now the largest CRNA conference, and one of the largest anesthesia conferences, in Arizona. And revenues go back into promoting and defending our profession. CRNAs of AZ PAC: One of the strongest healthcare PACs in the state. To our knowledge CRNAs of AZ PAC is the most successful state CRNA PAC in the country (per capita). We'll need more recurring contributors. if we successfully handle the Anesthesiologist Assistant situation that is coming in future years. MEMBERSHIP: I'll speak plainly. Far too many CRNAs in Arizona are not members - this hurts all of us. By nearly every measure - 2016-17 was successful and marked the end of a incredible 5-year run for the AZANA. Dr. Chad Peterson, CRNA oversaw the creation of a new 5-year strategic plan and a talented team as AZANA heads into 2017-18 with ambitious goals and high hopes. The 2017-18 term, is being led by Dr. Chad Peterson, DNP, CRNA as President, sees the AZANA emerging not just as a leading state CRNA association , but as a leading and influential organization in Arizona. The mission of the association is still the same: assuring patient safety, educating members, and advancing the practice of CRNAs. Our goals are still lofty and our passion still runs high, but now we are tooled with an incredible group of leaders, many who share different passions within our profession. Anesthesiologist Assistants loom larger than ever, what with the ASA committing to having AA legislation in every state by 2020. I am not inherently opposed to new professions - but I am - and AZANA is - committed to safety, access, competition and teamwork. New professions will be evaluated in that light. As for now, it's simple what Arizona CRNAs can do - and that's to join so many other CRNAs in becoming a PAC contributor with a small, recurring contribution. I won't simply tell you that "CRNAs have a bright future" - we do - if - we make the most of opportunities at every level. That means setting aside individual agendas to work together as a profession - in facilities and throughout the state. 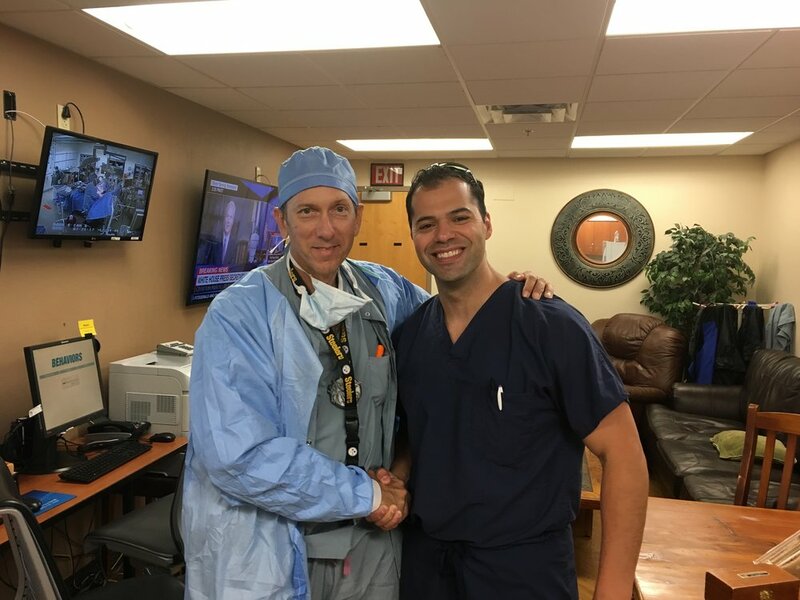 Joe Rodriguez pictured here with Dr. David Vertullo, MD. Intentionally building cross-professional relationships is key in excellent patient care. Image used with permission. The future will hopefully see less of the "us vs. them" dynamic that has been a defining mark of the anesthesia specialty. Clinically, the future belongs to teams where every member utilizes all their experience to maximize patient benefit, without artificial restrictions. This of course includes physicians and surgeons, and like so many CRNAs, I've been fortunate to practice with some great ones. This is a treasured stance for me - never sacrificing our own principles as CRNAs, we should always look for opportunities to build healthy relationships with other professions and move past old tensions. I'm proud that AZANA has officially recognized many of these physicians and surgeons over the past 5 years. I love the CRNA story. And I love being a CRNA, and advocating for, CRNAs. As CRNAs, we have a solemn duty - a duty to do everything we can to benefit our patients. Our patients are people - they have inherent value, they are part of families and communities. AZANA is essential in ensuring our ability to take great care of people - and in that way, being involved in AZANA isn't some career-building activity, or just something extra - it's the right thing to do. Knowing that, and knowing AZANA's done some genuine good over the past 5 years, I feel fortunate to have been given the opportunity to play my part in the AZANA.